In his Catalogue of Women, Hesiod mentions “the race of lazy, good-for-nothing satyrs,” a sentiment captured visually by Epiktetos on this drinking cup. 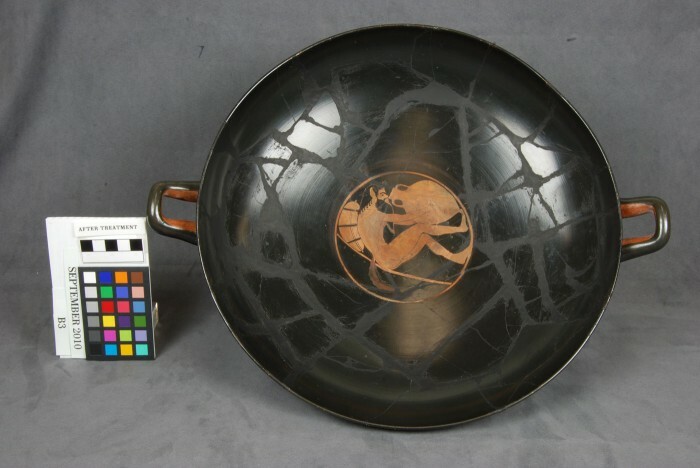 He signed the work “ ΕΠΙΚΤΕΤΟΣ ΕΓΡΑΦΣΕΝ ,” or “Epiktetos painted [this].” In this red-figure kylix, the painter utilized the circular, restrictive space of the tondo by pressing the satyr’s feet against a false groundline. 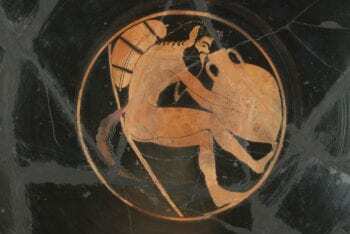 The satyr reclines on a symposium couch, or klinē . His equine tail plunges below the couch, creating a sense of depth and dimension. 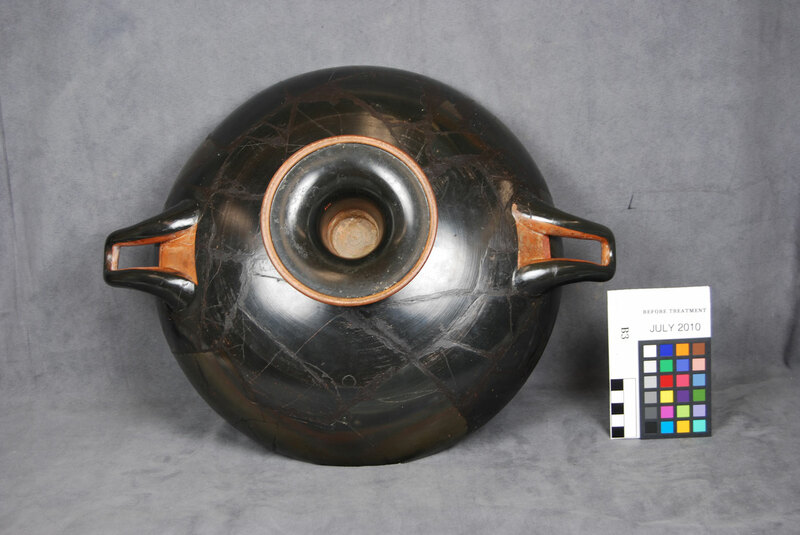 The satyr clasps an amphora, filled with heady, unmixed wine, as if it were a lover. Amorous and desperate, he holds the vessel by its belly, supporting its weight against his knee. 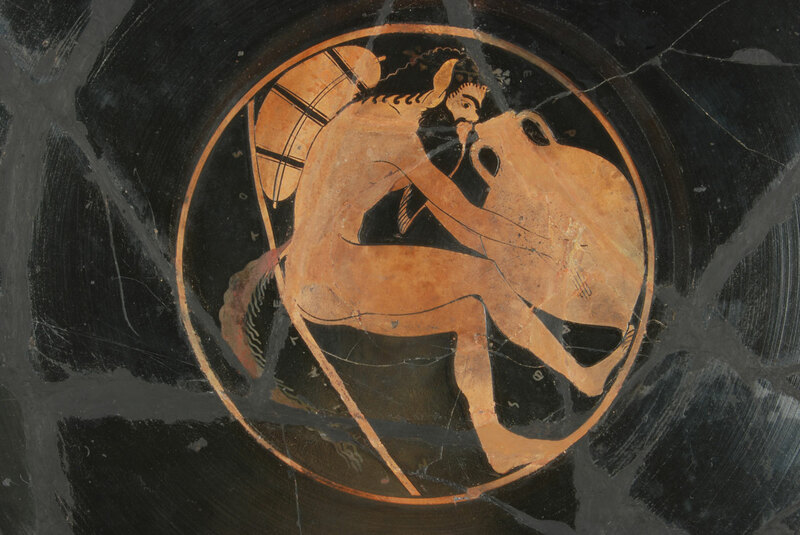 The satyr drinks straight from the storage vessel, poor decorum for any civilized Greek. Satyrs were hedonistic outsiders, the “anti-citizen.” Unable to control their bodily appetites, they provided an inverted view of ‘respectable’ behavior. As the symposiast drained the last drops of wine, he would encounter this crude hybrid figure, a reminder of the boundary between proper and improper, man and beast. This image cautioned against overindulgence, lest the drinker become sub-human, like the naked, unkempt satyr.